The UAIS (Universal Automatic Identification System), known as AIS, is a civilian information system, which makes it possible to exchange data between ship and land based stations. The system has been introduced by the International Maritime Organisation (IMO) and it is basically an anti-collision system for vessels at sea and AIS vessel tracking system of marine traffic. The system is also well suitable for monitoring the ship traffic in coastal areas. A ship equipped with AIS transponder transmits information on – ship’s name, position, course, speed, draft, type of vessel etc. The AIS information for the real time vessel position then is transmitted via radio communication to other ships equipped with AIS as well as land based AIS stations. The land based stations can send short messages to AIS equipped vessels within in a given area, thus providing marine traffic with important traffic and safety related data. The coastal AIS station has a very important restriction. It is not suitable for monitoring the marine traffic on huge open sea and ocean areas. The communication is lineof-sight allowing stations to monitor ships within about 30-40 NM of their location. Ability to monitor the marine traffic from space has been an expressed goal for the maritime authorities for years. 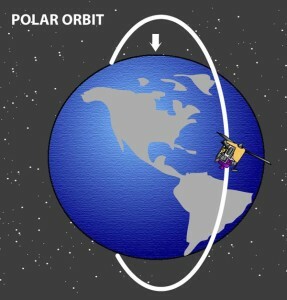 Polar orbit satellites can monitor the whole area several times a day. A challenge is very large quantity of data the satellite can receive. Today more than 70000 ships have installed the necessary equipment to transmit the ordered information, the so-called Class A equipment. The demand of Class B equipment for smaller vessels will increase the number of reports considerably. Every ship delivers 90 to 450 messages over 15 minute period. Some of the tasks for the satellite and the ground station are to filter out the AIS data that are of no relevance, but at the same time be able to add to the sources and time AIS information, which is necessary to separate satellite information from information to coastal AIS stations in order to monitor the marine traffic.